The Board, Directors, Cabin Fever Reliever Committee, and Members of Trapper Creek Community Services Association, Inc. would like to extend our sincere recognition and appreciation to the following for their help and support this year. 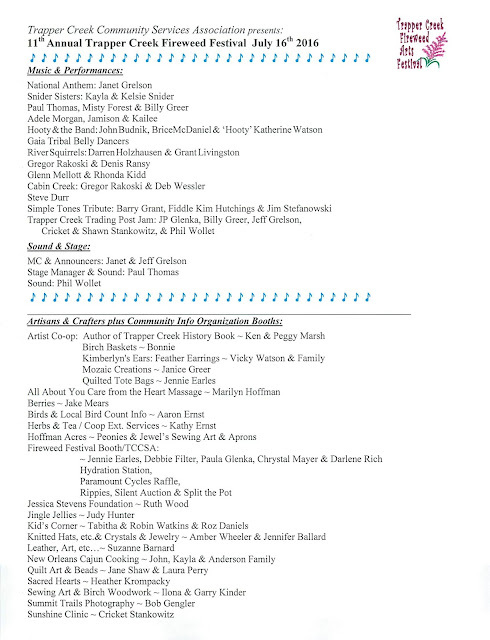 Cabin Fever Reliever was made possible by the contributions of many volunteers and generous businesses from the Upper Susitna Valley to Anchorage, Alaska. 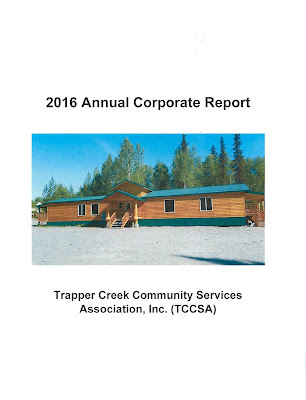 We are happy to announce that Trapper Creek Community Services Assoc., Inc. (TCCSA) and the former Trapper Creek Fireweed Arts Council have joined forces. 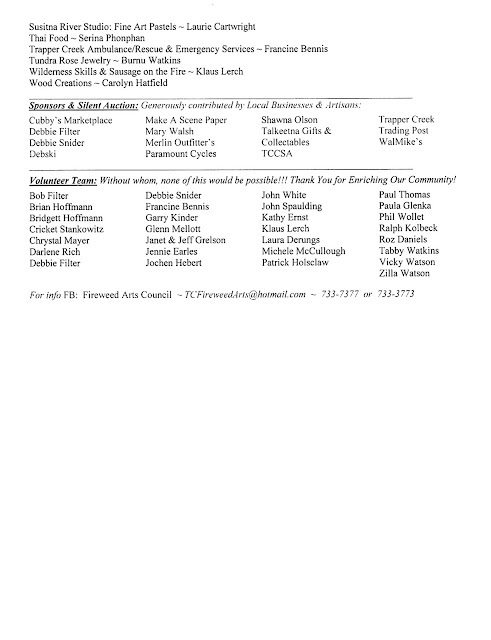 With the two organizations using the Community Park facilities for festivals, one in the summer and one in the winter; both organizations having the majority of members in common; and each with the same goals to benefit Trapper Creek, it is not only a great idea, but efficient to combine resources and work together as one non-profit organization. The Fireweed Festival Committee of TCCSA, with many of the same people who have organized the festival with the best of care and success for ten years, is hard at work preparing for the 11th Annual Trapper Creek Fireweed Arts Festival on Saturday, July 16, 2016.
tcfireweedarts@hotmail.com or through the Facebook page of the Fireweed Arts Council. TCCSA: 907-733-7375 or email tccommunityservices@yahoo.com. Susitna Valley to Anchorage, Alaska. Cooking at the Grill - Pat Holsclaw & Pat Jr.